Mr Crocodile needs a job – but what should he be? He could be a soccer star: Mr Soccerdile. Or perhaps a cook: Mr Cookodile. But wouldn’t it be much easier for a lazy croc to turn into Mr Crookodile and rob a bank? 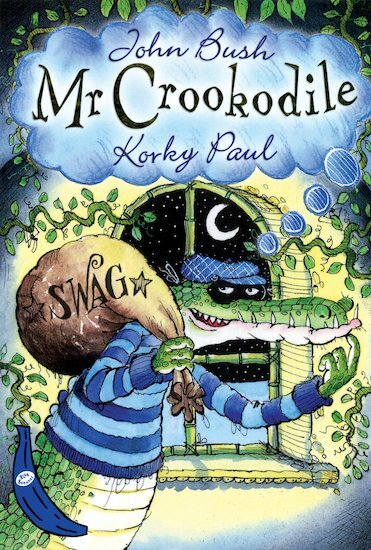 However, despite a cunning disguise, Mr Crocodile’s naughty plans start to unravel in a very funny way… In a short reader-style format packed with hilarious colour illustrations by the much-loved Korky Paul, this comic caper will have newly independent readers laughing all the way to the bank! This is a very funny story about a lazy crocodile who decides to become a criminal. But things go wrong and he learns that being bad is not very clever after all! The pictures are really great.